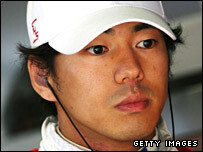 Japan's Sakon Yamamoto has joined Renault as a second test driver alongside Frenchman Romain Grosjean. Yamamoto raced for Spyker in the last seven races of 2007 but was dropped by the renamed Force India team for 2008. Renault team principal Flavio Briatore said: "We plan an aggressive development programme for the year and his experience will be useful. "Sakon will boost our visibility in important markets. He will be an important asset for the team." Yamamoto previously drove for Super Aguri in 2006 but was replaced by Britain's Anthony Davidson at the end of the season.